New work by Amy Pleasant is now on view at Shoreline City Hall on the second floor. In the continuing thread of Pleasant's exploration of generational transitions, these paintings, contain a barely visible traditional underpainting covered by painterly layers and fluid ink images reflecting one generation's willingness to relinquish the role of power to next generation. While I have made it a focus of my art, we have all been marking the exit and entrance of a generation or two or three. As much as I appreciate and honor the contributions of past generations and of our own, history is the final arbiter of a generation's impact for good or for ill. 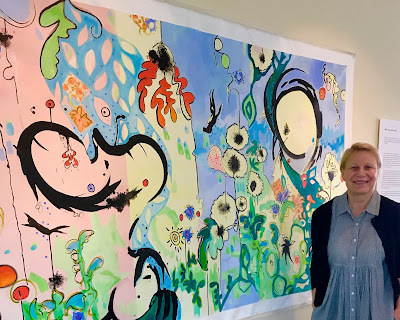 The artist will be onsite on August 1st and 2nd, 10am-3pm and will be setting up a studio area in the main lobby of city hall working on a painting over the course of the two days. The public is invited to stop by and see the process and progress of the painting. Shift: New World Coming will be up until mid October.